Two new parks, a future preserve, and completing a portion of Ohio to Erie Trail are in the works for Preservation Parks of Delaware County. The park district’s 10-year, 0.6-mill levy expires at the end of 2018. This November, Preservation Parks is asking for a renewal of that levy, and an additional 0.3-mill levy, for a total millage of 0.9-mills. Currently, county property owners are paying $19 per year per $100,000 valuation. If the levy is passed, that amount would increase to $28.86 per year. Hagan said the levy passage will allow the district to continue serving the people of Delaware County. “Passing this levy will allow Preservation Parks to continue to protect natural areas and provide places where people can connect with nature, enjoying precious time with their families and friends in beautiful areas, while protecting habitats and water resources,” she said. Preservation Parks was founded in 1974, and began in earnest 1989, but didn’t pass its first levy until 1999. A second levy renewal with additional funding was passed in 2008 on its first attempt. Preservation Parks receives 80 percent of its revenue from the levy, and those revenues are often used as matching grant funds to purchase future parkland. For example, one of the proposed new parks is the Logan property on Pollock Road in Delaware Township. The 115 acres are 100 percent acquired by Preservation Parks, and the $2 million development would include trails, sledding hill, fishing pond, a large year-round shelter and restrooms. The earliest the park would open is 2019, said Hagan. Another new park would be in Orange Township along Bale Kenyon Road. 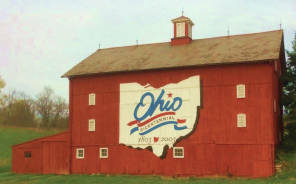 Along with farm fields and wooded ravines, the property may be best known for its Bicentennial barn, which will be restored for use. The park district has spent $4 million to purchase 112 acres, buying a parcel at a time with the help of Clean Ohio Grants. There is an agreement to purchase 26 more acres. In the far northeastern part of the county, the park district has a 57-acre preserve on Plantation Road in Porter Township. Some of the district’s park land is part of the Ohio to Erie Trail, running from the Ohio River to Lake Erie. There are some segments that the Village of Galena is working on, and there are sections in Delaware County and a sliver of Licking County that is not connected. That sliver goes up to Knox County, where the trail is completed. “Part of our goal with this new levy is to continue to work to acquire that last bit of right-of-way so that we can complete that part of the Ohio to Erie Trail,” Hagan said. Among the properties in the park district is Hogback Ridge, which has a Sunbury mailing address. Hogback is where the district’s Board of Park Commissioners meets monthly. In August, the commissioners paid tribute to the late Jim Bargar. A commissioner from 1989 to 2013, Bargar was previously an architect designing Metro Parks and state parks like Indian Lake and Grand Lake St. Mary’s. “(Bargar) was instrumental for us as a volunteer in helping Preservation Parks design several of the early parks that were starting to be designed even before we passed that first levy in 1999,” Hagan said. One of those early parks is Gallant Woods, a former farm which was the site of a recent mud run. Another one of the district’s 10 properties, River Run Park, was instrumental in Preservation Parks receiving a 2017 Conservation Award in June of this year at the Northern Olentangy Watershed Festival. River Run, which opened in 2016, is south of the Delaware Lake dam and serves as a drop-off point for canoeing and kayaking. Bicentennial Barn at Alum Creek will become part of a new development for Preservation Parks of Delaware County. For information, visit www.preservationparks.com, call 740-524-8600, or email contactparks@preservationparks.com.